Are you trying to grow your scaffolding company? There are tonnes of advertising strategies you can learn about on how to advertise a scaffolding business both online and offline. Scaffolding businesses are in one of the many industries lagging behind in regards to modern day advertising techniques. We still see many scaffolding firms in things like the Yellow Pages and then refuse to get their own business website. If you were looking for a local scaffolding business and had no idea where to find one, where would you look? Oh.. wait, let’s guess… The internet? Many scaffolding business owners believe that because it’s “only scaffolding” and no one cares or will bother to look. And that’s the point of this article. I want to teach you the things that most other scaffolding businesses aren’t doing with their advertising campaigns. If you are unsure about anything mentioned in this article, please feel free to contact us and I will do my best to answer any questions. As a scaffolding business you’ve probably stuck to the traditional methods of advertising, such as word of mouth, leaflet drops, networking with local builders, etc. This is all great and you should still do this regardless of what anyone or any advertising company say. Even me! But let’s be frank for one second.. When 95% of your competition have websites, why would you want to be the only one without one? How can a website for your scaffolding business help? However, let’s talk facts quickly. How do you find a local business? Let’s say a local window cleaner. Yes, you might know Dave down the road who cleans the odd window or two, but if you were new to the area you would do a quick Google search. 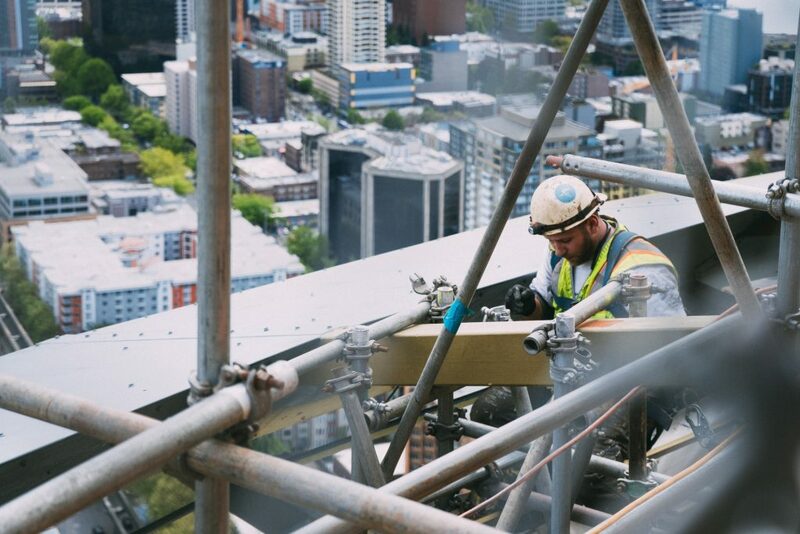 Luckily for you, not everyone knows a scaffolding business, so people will actively need to search for local scaffolding businesses in order to find the services they require. Getting a website designed doesn’t have to be a long winded or expensive process. Now I may be a little biased here because I own a web design company, but even if you are strapped for cash or just starting up your scaffolding business, there is always someone out there who will build you a cheap website. If you would like some help with getting a website set up we can help provide you an affordable business website package. To be honest, getting a website set up and launched online is the easy part. But no fear because ShyFish Designs are here (obviously a joke). Get to the first page on Google! Yes OK, I know, you probably get about 10 calls a week saying “I can get you to the first page of Google” and most of the time it’s spam. However, figuring out how to rank your small business website higher on Google is not impossible. It takes time and patience but the reward is worth it. For example, we have a scaffolding company who are ranked on the first page for their county and main town which receives around 80 searches a month from people looking for scaffolding in their local area. Nearly all established small businesses are using social media nowadays. But how do you advertise a scaffolding business using social media? Well it’s definitely not a way to get instant leads for your small business, but similarly to a business website, it takes time and patience. However, there are several social media websites and advertising techniques you can use that will work best for a scaffolding business. What social media websites work best for scaffolding firms? Create a business page on Facebook. This is easy and free. All you have to do is look down the left hand side of your personal Facebook and click “create page”. From there it’s easy enough to figure out. Here’s a great article I’ve written that will teach you things that will help improve your Facebook business page. Now Twitter is a great tool for a scaffolding business to advertise through. Use the search tool within Twitter itself to find local people and builders in your area that would be interested in your service. Don’t spam, network. Send out friendly welcome tweets with a great offer (e.g. “Struggling to find a reliable scaffolding firm? To show how much we want to help, let us write out a free quote for you”). The difference with LinkedIn is that it’s a professional network designed to help link professionals together. It’s AMAZING for finding other local businesses that may require your scaffolding services. Make sure you search for local building firms or roofers (for example) and then connect with them. Make sure you don’t spam because LinkedIn is designed to help develop B2B relationships. Social media tip: Make sure you clearly separate your personal accounts from your business accounts! You don’t want potential customers seeing you 5 pints in on a Friday night. I always get asked does PPC advertising work for small businesses? Yes (if you are careful)! Pay per click advertising can be a tricky but rewarding advertising method. Pay per click, also known as PPC, is when you pay a search engine (e.g. Google, Yahoo, Bing, etc), to show your adverts on the first page of Google for certain keywords and phrases. For example, if you ran a PPC advert for your scaffolding company then you could set one up saying “scaffolders in xyz – your local scaffolding service” or “scaffolders in xyz – free quotes available”. The idea behind PPC adverts is that you ONLY pay once someone actually clicks your ad and visits your scaffolding website. This is a great way to advertise a scaffolding business because it enables business owners with all budget sizes drive potential customers to their website. This method of advertising is extremely beneficial if you are requiring quick results and instant leads. However, this should take careful consideration as the wrong PPC campaign can drain your bank account (unfortunately, I found this from personal experience). Local networking events are a great way to find other local business who require your scaffolding services. Remember only attend events where your customers will be going to. For example, there’s little point in going to a scaffolding networking event because why would another scaffolder want to use your scaffolding services? Obviously, they wouldn’t. Instead try and attend other business networking events, such as local roofing or building companies. One thing to consider is your value proposition. How can you help your customers before you ask for anything in return? Maybe provide them with free quotes or consultation to develop the relationship early on. The sale will then quickly follow. Ask open ended questions and like you always are, be friendly and transparent. Some networking events will be beneficial, but equally some will be an utter waste of time. Trial and error is key here. Now saying all of this we definitely can’t write off other forms of offline advertising. I mainly stick to online advertising but the older methods still work. Word of warning! Please make sure the value of the advert placement is actually worth the price they charge. For example, if there was an advertising space in a local magazine that cost £800, how many potential customers will actually see your advert? A) Leaflet Drops Now you may be thinking, do leaflet drops actually work for small businesses and the truth is they can. Quite a few scaffolding businesses we’ve have built websites for have actually had quite successful leaflet drops. However, think about the type of customer you are trying to target and then tailor your leafleting campaign around it. B) Warm Calling People have a short memory and need to be reminded. Occasionally, give old customers a quick ring, text or email to remind them or your services. This will be easy than generating new customers because you already have built relationship with them. C) Discounts and offers People can’t resist a great offer or discount; especially when they need or want to use your service. This method will help convert the people who need that little extra push to make the sale because it creates a sense of urgency. D) Press and media This advertising method is a tricky one and can be costly. It consists of advert placement inside magazines, local newspapers, banner boards, sponsorships, etc. It can be costly but effective if executed correctly. Think where your potential customers ‘hang out’ offline… Right, now narrow those ideas even further and pick the one that best suits your ideal customer. For example, if you work best with local builders, then maybe a building material supplier would work best. I really hope this article has helped you understand how to advertise a scaffolding business. Both from an online and offline perspective. Try and focus on a 2 or 3 of the above. On the contrary, don’t only start one advertising method because it won’t be around forever. You need to ensure your scaffolding business is being drip fed leads from different sources. The best advertising mixture for our scaffolding company clients is having a website, good Google ranking position and warm calling with special offers. If you are still unsure about how to advertise a scaffolding business or have any specific questions, then please feel free to get in touch and I will be more than happy to guide you through the process.